The 32 Observations series continues with Nathan Jahnke, PFF’s Director of Analytics, finding an interesting piece of information about all 32 teams after five weeks of football. If you would like to make some observations of your own, you can do so with PFF Elite, where you can find several signature statistics for every offensive and defensive position in football, thanks to Premium Stats 2.0. Buffalo Bills: Center Russell Bodine is one of two centers this season who have not allowed a single pressure on their third-down pass-blocking snaps. 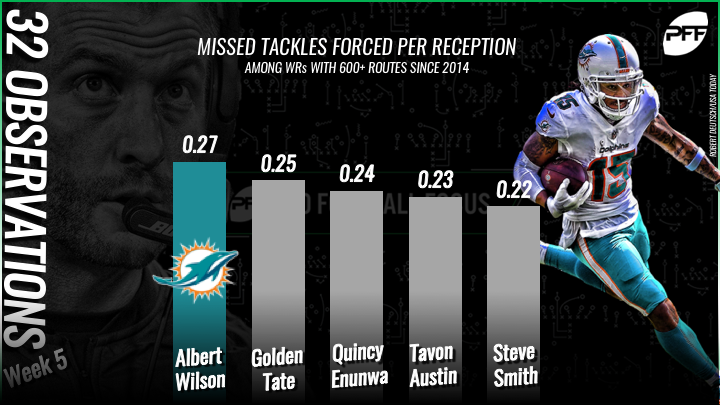 Miami Dolphins: During Albert Wilson’s five-year career, he’s averaged 0.27 missed tackles per catch. That is the most for any wide receiver with at least 600 routes during that time. New England Patriots: Since joining the Patriots, wide receiver Josh Gordon has averaged 3.04 yards per route run. That is the third-most for a wide receiver with at least 25 routes with a team this season. New York Jets: Robby Anderson leads all wide receivers this season in both receiving yards and touchdowns from ‘go’ routes, with 152 and three, respectively. Baltimore Ravens: Wide receivers Willie Snead IV and Michael Crabtree have forced six and five missed tackles on receptions, respectively. The Ravens are one of just two teams with two wide receivers who have forced at least five missed tackles. Cincinnati Bengals: Since the start of the 2016 season, Carlos Dunlap has 24 batted passes. The only other edge defender with more than 12 in that span is Cameron Jordan. Four of Dunlap’s batted passes have come this season, which is tied for the most for edge defenders. Cleveland Browns: Cornerback Denzel Ward has allowed an average of 0.92 yards per coverage snap. Since 2006, this is the second-best mark for a rookie outside cornerback after Week 5. He’s done this despite being tied for the second-most targeted cornerback this year. Pittsburgh Steelers: Tight end Vance McDonald has averaged 0.30 missed tackles per reception since joining the Steelers in 2017, which is the best rate for tight ends in that span. He leads the league in tackles avoided for tight ends this season, with 6. Houston Texans: Safety Tyrann Mathieu is one of 20 safeties with five or more run stops this season. Out of those 20, he is the only one who hasn’t missed a tackle in the run game. Indianapolis Colts: Rookie edge defender Kemoko Turay has 17 pressures when lined up at the right edge. That is the third-most pressures for all players when lined up in that position. Jacksonville Jaguars: Wide receiver Dede Westbrook has been the king of crossing routes. He leads the league in targets (16), catches (14), yards (282), yards after the catch (153) and tackles avoided (4) on crossing routes this year. 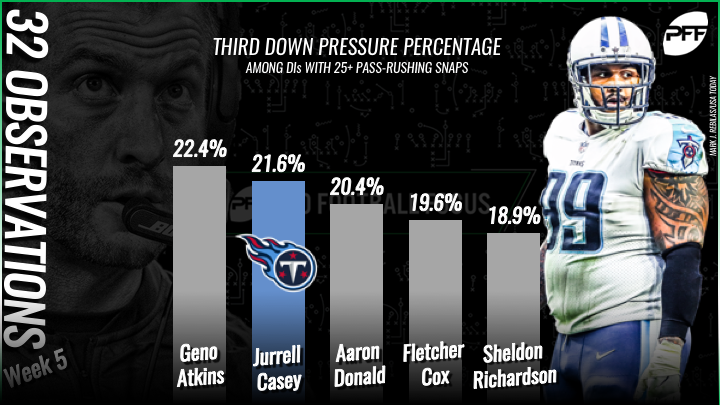 Tennessee Titans: On third downs, Jurrell Casey has pressured the opposing quarterback on 21.6% of his pass-rushes, which is the second-best rate for interior defenders with at least 25 snaps. He has two sacks, two hits, seven hurries on 51 third-down rushes. Denver Broncos: Rookie running back Phillip Lindsay has run for five or more yards on 45.8% of his carries this year, which is the best rate among backs with 40 or more carries. Second-best in the league is teammate Royce Freeman at 44.9%. Kansas City Chiefs: Over the last calendar year, right tackles have collectively allowed 202 sacks. In that same time, Mitchell Schwartz has played 658 pass blocks and hasn’t allowed a sack on any of them. 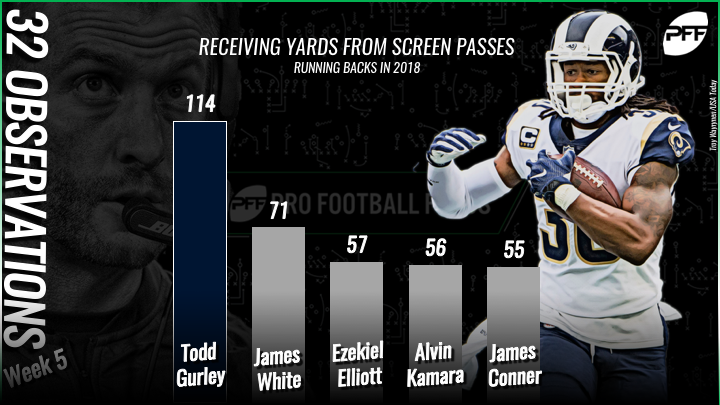 Los Angeles Chargers: Over the last calendar year, Desmond King II has produced 26 defensive stops on passing plays, which is the most for any defensive back in that span. Oakland Raiders: Cornerback Rashaan Melvin has one interception and two pass breakups on third down this year. That is tied for the league lead in both categories. Dallas Cowboys: Edge defender Demarcus Lawrence has nine tackles for loss or no gain in the run game, which is the best for any defensive player in the league. New York Giants: Over the last six seasons, Damon Harrison has 220 run stops. That is the most for any defensive player regardless of position. No other defensive lineman is within 50 run stops of Harrison. Philadelphia Eagles: Quarterback Carson Wentz has an adjusted completion percentage of 80.5% – which is better than any quarterback from last season, and over 10% higher than his mark from 2017. 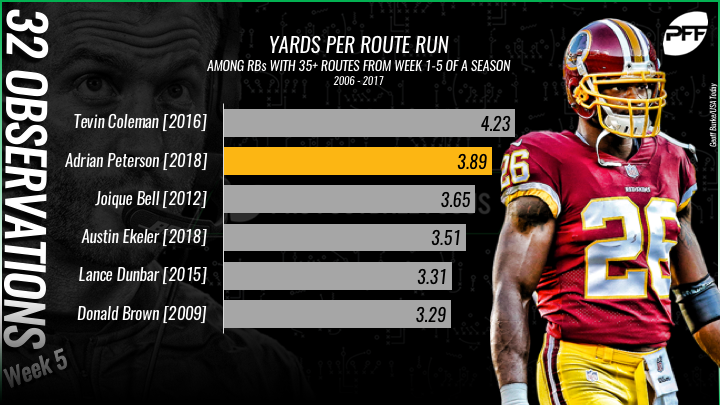 Washington: Running back Adrian Peterson is averaging 3.89 yards per route run, which is the most among backs with at least 20 routes run this season. He is currently on pace to have the most receiving yards of his career. Chicago Bears: Cornerback Kyle Fuller has allowed 1.3 yards after the catch per reception allowed, which is the lowest rate for cornerbacks this season. Detroit Lions: Running back Kerryon Johnson has been tackled for a loss on just 4% of his carries, which is the second-lowest rate for backs with 40 or more carries. Green Bay Packers: Aaron Jones is averaging 0.38 missed tackles per attempt this season, which leads all backs with 20 or more carries. Minnesota Vikings: Of the 22 tight ends with 45 or more catches since the start of the 2017 season, Kyle Rudolph has the fewest drops with 1. He hasn’t dropped a pass since Week 14 of the 2017 season. Atlanta Falcons: In 2017, the Falcons ran outside zone on 45% of their run plays which was 8% more than any other team. In 2018, they have increased their use to 54% which is again 8% more than any other team. Carolina Panthers: Since being drafted in 2016, cornerback James Bradberry has been thrown at 18 times on go routes. On those routes, he has allowed just one catch, and he’s also tallied three pass breakups. New Orleans Saints: Right tackle Ryan Ramczyk has pass-blocked 45 times in the fourth quarter this season, and hasn’t allowed a pressure on any of them. Tampa Bay Buccaneers: Defensive end Jason Pierre-Paul has seven combined sacks and hits on third down pass-rushes this season. That is tied for the most for all edge defenders. Arizona Cardinals: Running back David Johnson has had 18 rushing attempts where he has needed 2 yards or less for a touchdown over the last three seasons. He has scored on 13 of them, including one this past Sunday. His conversion rate is the best among those with 15 or more such attempts in the last three years. Los Angeles Rams: This season, Todd Gurley has caught eight screen passes for 114 yards. That is 48 yards more than any other back on screens this season. San Francisco 49ers: Third-round rookie Fred Warner has 18 stops in run defense, which is two more than any other defensive player regardless of position. Seattle Seahawks: Safety Bradley McDougald has two interceptions and three pass breakups. His five interceptions and pass breakups combined are the most for a safety this season.